In 1483 Edward V and Richard, Duke of York disappeared from the Tower of London. They were the sons of the late Edward IV and his queen, Elizabeth Woodville. Edward V was born 2 November 1470 in Westminster Abbey where his mother had taken sanctuary from the Lancastrians who had deposed his father during the Wars of the Roses. His brother, Richard was born 17 August 1473 in Shrewsbury, England when Edward IV ruled over England once again. Shortly before his sudden death on 9 April 1483, King Edward IV named his brother Richard, Duke of Gloucester, Lord Protector of the realm for the young Edward V, who was only 12 years old. It was at Ludlow Castle that young Edward was notified of his father’s death and his succession to the throne – he was to travel to London immediately in preparation for his coronation. As he traveled from Ludlow, Richard (Lord Protector) met and escorted him to lodgings in the Tower of London. Edward’s brother, Richard of Shrewsbury, Duke of York joined him shortly after. Edward’s coronation was to be on 22 June 1483, but before the young king could be crowned his father’s marriage to his mother Elizabeth Woodville was declared invalid – making their children illegitimate and ineligible for the throne. This left an opening for their uncle Richard to take the throne himself. The last time the boys were seen in or around the grounds of the Tower of London was the summer of 1483 – they were never to be seen again. A decade later, in January 1493, news of a resurrected Duke of York (in Ireland) had reached London. Just six years earlier another boy by the name of Lambert Simnel claimed to be the young Duke of York but turned out to be a pretender. The idea of another pretender must have seemed preposterous and fabricated at the time. However, when the news of Perkin Warbeck arrived in England, Yorkist supporters jumped at the chance to back anyone who claimed to be Richard of Shrewsbury, Duke of York. Henry VII took the threat of Perkin Warbeck seriously. So seriously he dispatched 200 men to Ireland. Their job was to arrest those that may be involved or cause trouble for the throne. He also sent spies to dig up the truth of the new pretender to expose him as a fraud. Any legitimate, surviving son of Edward IV would be considered a threat to Henry’s crown. By end of June of the same year (1493) the danger seemed over. Nothing had happened in either Ireland or England. In Flanders, Margaret of Burgundy (aunt to the princes in the Tower) had been unable to raise funds for the army she needed to assist her nephew in taking back the throne of England for the House of York. Margaret was sister to Edward lV and insisted that Warbeck was indeed her nephew and heir to the throne of England. When Margaret continued to throw her support towards Perkin Warbeck Henry VII became angry and declared his son, Henry Tudor (future Henry VIII) as Duke of York in a magnificent ceremony. There could not be two living Dukes of York in England. 1493 was also the year Perkin Warbeck wrote a letter to Isabella of Castile looking for support while trying to convince her that he was indeed Richard. During this time period Henry VII was negotiating the marriage of his son Arthur, Prince of Wales with Katherine of Aragon – daughter of Ferdinand of Aragon and Isabella of Castile. Resolving the issue of the pretender was of utmost importance to both parties. Ferdinand and Isabella would not want to align their daughter with a usurper. For the next couple years Warbeck worked on a plan and tried to gain more supporters. At the beginning of 1496, James IV of Scotland had arranged and celebrated the nuptials of Warbeck and his cousin, Lady Katherine Gordon. Surely James IV believed he was the rightful Duke of York and king of England, why else would he marry his cousin to Warbeck. Soon after the wedding Falkland Palace was used as Warbeck’s base. Together they planned to invade England in hopes of claiming the English throne as Richard IV. In 1497, after departing Scotland, Warbeck crossed to Ireland. When he arrived he found no allies and was being pursued by the Earl of Kildare. In a country that had supported the House of York, Warbeck was sadly not welcomed, so he sailed to Devon. I can only imagine how Queen Elizabeth reacted to the news. Did she believe that Warbeck was indeed her young brother, Richard of Shrewsbury, Duke of York? We don’t know for certain what happened to the princes, or the people involved in their disappearance, but those involved would have certainly been aware of the true status of the boys and react accordingly. This is why I believe Henry VII was not involved. If he knew that Richard was dead, by his hand, or his orders, he would not have sent an army or spies to investigate the pretender. So what really happened to the boys? Were they both murdered? Did Edward V die from natural causes and his brother Richard escape? Did Elizabeth Woodville send a local boy in place of her youngest son and ship Richard off to safety? 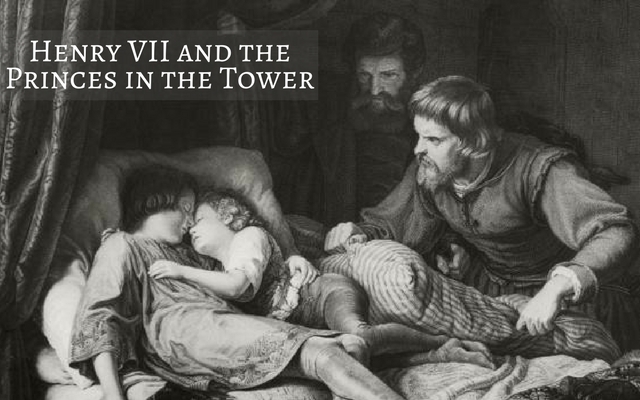 Is the mystery of the ‘Princes in the Tower’ set to be uncovered? We can not be sure Henry VII was not involved.He might have just pretended he has no idea what happened to the princesses in the tower and to back that up he would have send those man to investigate.He had won the crown in a battle and he knew he can lose it in a battle too.And a York prince(even a false one) had a stronger claim over the throne than him. Any children skeletons found thought to be them were possibly identified by a genetic bone disease but most children of that time whether rich or poor had some kind of calcium deficits due to limited foods available at that time? The two boys weren’t seen after late summer 1483. Rumours that they’d been killed by RIII were circulating during his lifetime; he might have dealt with those rumours by producing the boys, but he didn’t. In fact he said nothing about them at all. Did he not notice that they’d disappeared? The idea that HVII had them done away with requires us to imagine that between 1483 and 1485 the boys were alive but were, well, where? As to them being sent abroad to be brought up in ignorance of their own origins – they were beyond the age of infantile amnesia; certainly it’s comforting for those who would prefer to believe that RIII is innocent, that he very kindly had them spirited away, but it seems to be grasping at straws. He had means, motive and opportunity, and when it comes to killing people he found inconvenient, he had form. What do you think about bodies being discovered which were supposed to be the princes ? I am more into the Tudors but of course this takes me back to Richard!!!!! Am writing my first Tudor novel at the age of 69 !!!! I must be cracked !!! He’s had them made illegitimate and taken the crown himself; in the event of his death they couldn’t take the crown; certainly he had no real expectation of Henry Tudor pulling off an away win at Bosworth and in any case had named Lincoln (I think) his heir. The two boys don’t seem to have figured at all in his plans – there is no record of any provision for their livelihood or care, nor of any estates or property to be settled on them. They just fall off the radar. As to the skeletons, I really don’t know. The ages ascribed to them fit teenage boys of a later period but not necessarily of the C15th. It would seem to me it all looks like Richard III.. What is missing is Elizabeth of York’s opinion about all of this and her mothers.. So little left of what they thought.. Obviously Elizabeth Woodville had hope as she seemed to be involved with her husbands sister.. This seems to be the entire missing part of all of this.. Elizabeth Woodville and her daughter were the key to all of this. So if that was the case,although young,the boys were old enough to know who they were,so why didn’t they speak out later on? I can always put it down to senility!!!! Even the most die-hard, pro-Richard III group has never considered Margaret Beaufort as a possible suspect in the disappearance of the Princes. She had no access to the Tower of London whereas Richard III did. This theory has been put forth by a certain writer of historical fiction to the great detriment of the reputation of Margaret Beaufort. What a pity we can’t all go back in time and ask these people because as my favourite factual historical writer Alison Weir has said ,nobody can really say now that we know positively what went on ,because we weren’t there ! The article makes clear that Henry sent investigators into the pretender-thus confirming that he knew the boys were dead and that PW was a fraud. Btw-Lambert Simnel was impersonating Edward, Earl of Warwick (Clarence’s son). I recall reading that he had started as Edward V, then changed to Warwick. I don’t recall him ever claiming to be Richard. What a lot of skulduggery went on then !!! This begs the question why didn’t they surface later on and stake their claim? Would you want to go back into the Tower !!!! And Margaret Beaufort would have made sure they did !!! really don’t think RIII had them murdered. If they were declared illegitimate and ineligible for the throne, then they were no longer a threat to Richard, or his son and heir. And there is evidence that Richard truly loved his brother Edward IV, and was very fond of his nephews, at least when they were small. I think he has been unfairly vilified, certainly he did usurp the throne, and certainly the princes wouldn’t have been in the tower if he had not intercepted their journey, but i think that’s as far as his part in their death goes. I also don’t think Henry VII was responsible for their deaths, or why was he so unsure whether perkin warbeck was a real threat to him? The person i do think was responsible for the death of the princes, is Margaret Beaufort, the mother of henry VII. She was fanatically ambitious, and absolutely convinced that she and her son were destined for greatness. I believe she would have stopped at nothing to see her son on the throne, and her close personal relationship with the constable of the tower at the time would’ve given her ample opportunity to have the boys quietly dispatched, leaving only one more person between her son and the throne – Richard III. They were most definitely still a threat to his crown. They were rightfully the heir who were deemed illegitimate by Richard. Those who supported the York princes would never let up until they were back on the throne. He would essentially extended the Wars of the Roses if he had let them live. As far as Margaret Beaufort, what do you base your theory on? She had no access to the Tower at the time and her husband was not there.